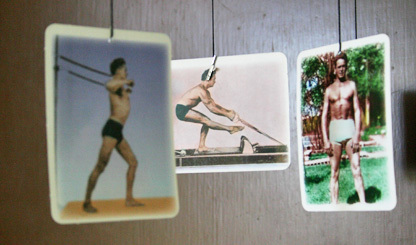 Joseph Pilates originated this methodology In the 1920’s. Using springs attached to a hospital bed, he assisted infirmed soldiers who were his trial students and observed improvement in their health with his concept of resistive training. These observations in changes of health acted as the catalyst and prototype for developing his Pilates Method originally known as Contrology. Upon arriving in NYC with his wife Clara, he began to expand his concept and worked intimately with dancers and athletes to develop a formidable exercise system that has gained national recognition. The fundamentals of Pilates uses mat exercises and specialized equipment that are familiarly known as the Reformer, Cadillac, Wunda Chair, Large and Small Barrels. Coupled with the principles of Breath, Centering, Concentration, Control, and Precision one begins to explore an awareness and depth with their inner and outer musculature which truly defines what it is to use the “core”. Recruiting these muscle groups, which is not easy at first, is similar to exploring a jewelry box. We are delving inside to discover buried jewels. The integration of the Pilates principles with the accompaniment of mat exercises and the guidance of the specialized equipment facilitates improved alignment and posture, deeper strength into the pelvis, abdominal and thorax, elongation of the spine and pain free movement that builds strength and develops flexibility. This detailed and varied movement system lends itself to all populations whether it’s used for strengthening or rehabilitating from an injury. Used together with a cardiovascular activity, creates a well balanced approach for movement and health.